Tooling isn’t something that you can just read one book about, watch one youtube video, or spend one weekend in a workshop and become a master at. 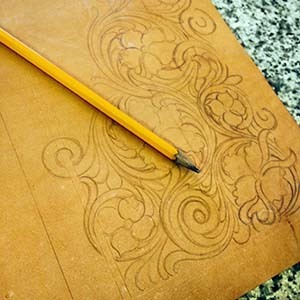 Learning to draw leather tooling patterns and to tool them, takes practice and commitment to the idea that you will become a true life long student of the subject. You have to be okay with the fact that you will never be a finished tooler that requires no more training or growth. Leather tooling patterns change over time and styles are always on the move. The tooling designs that you come up with today, will be different than the patterns you design 10 or 20 years from now… even if only slightly. The bulk of leather tooling patterns is the “fill” or vine work that surrounds the flowers and other elements within the pattern. As we talked about in a previous section, this fill determines the direction and flow of all the elements. This is the part of the pattern that is the reason for different elements being where they are in the pattern. Designing the fill is where the majority of the creativity is shown in your designs. You have the opportunity to be as creative as you would like to be with this area of your patterns. You are free to design the fill in any way that you find fits with your style but you are bound by the rules of direction and flow. This means that as you begin to construct the fill of your pattern, you must be aware of the direction and flow that you decided upon when laying out the framework of your design. Before we begin trying to construct the fill of any of our leather tooling patterns, we must first understand the different aspects of the vine work that make up the fill. Much like flowers, leaves, and other elements that you will draw, the vine work has certain aspects in their design that need to be understood to design them well for tooling into leather. The simple vine structure that is most common is shown in this drawing. As you can see this structure is usually used in conjunction with many of the same in order to create a group of vines moving along a circle or flow line to create the fill. When we dissect one section of the vine work, we can see that each one of the vine segments is simply a LONG LINE and a SHORT LINE. The Long Line is the bottom side of the vine and is the part of the vine that gives it its length and its motion. 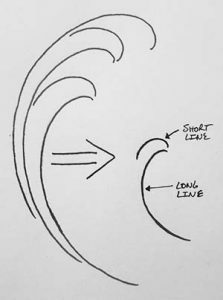 The Short Line is the top of the vine and the portion of the vine that finishes off the vine. This short line normally intersects the long line of the next vine up the line. 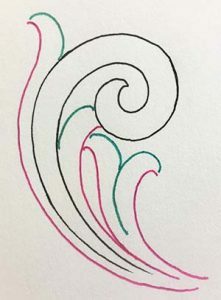 In this drawing I have drawn the Long Lines in pink and Short Lines in green. You can see here how the long lines are setting motion from the flower at their tips and curving back towards the layout circle as they get longer. Each long line is spaced apart taking into consideration the space needed for the short line while considering the size of the background piece that will be left. If you want more background or less, then you would space the long lines accordingly. If they are closer together, you will have less background. If they are farther apart you will have more background. After the long lines are in place, the short lines are added in which closes off the vine and separates it from what is to become background. The long lines are set in place using the layout circle as a guide for their motion. The long lines are not touching the circle as they end. This is to leave space for the next long line to come in. This same concept is used on flow lines as well as we will see next. This same architecture works on flow lines as well to carry the desired motion of the vine work on a given path. No matter what side of the flow line the long lines are on, they still work back towards the flow line much the same way they do in a layout circle and do not touch it. This simple idea of the framework should help you to see the way the majority of vine work is created and why. Virtually every piece of vine work can be broken down into the two individual pieces that are used to create it… the long line and the short line. Take a pattern that you have drawn before reading this book and use two different highlighters to highlight the long lines and short lines in your pattern to see what areas of your design you need to work on. Many times there are places in a pattern where there is not quite enough space for two separate vines, yet too much space for only one vine to be there. This is when two leg and three leg vines come in really handy. These are constructed in much the same way as any other vine. The three leg vine, as drawn here, has three long lines and three short lines. This allows you to add a small amount of motion in a tight area as well as gain a glimpse of direction change within the pattern. A two leg vine would be the same as the three-leg only without the center long and short line in it. Although Scrolls are technically a part of vine work, I do not consider them a part of the Fill. These are more of an element in the pattern and we use them as focal points to enhance the balance and motion of the design. For this reason I do not use the terms Long Line and Short Line when referring to their construction. 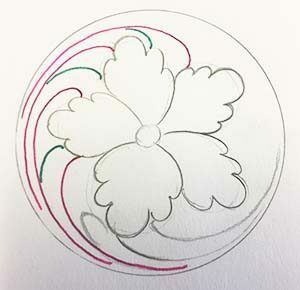 They would be drawn into the pattern much the same way as a flower or leaf. I usually decide on their placement in the pattern during the framework or initial lay out of the design. This is to ensure that I have them balanced the way that I want them and in place before I begin adding in my fill. Once the Scroll is drawn, you can build upon it with your vine work as we have discussed using the scroll as your flow line or guide for flow. The vinework of any floral pattern is, for me, the funnest part of the pattern. This is where you can let your mind go a little and be as creative as you want. Outside of the handful of fundamental rules, there are no limits to what you can create within this aspect of the tooling. If you are just getting started in drawing your own leather tooling patterns, then I would strongly suggest focusing on the vinework in your practice sessions. Drawing vinework is very often the most challenging part when folks are learning to draw. Take the time to practice everyday until drawing vinework becomes second nature. Then you can turn your attention to Drawing Flowers and Leaves. Did you find this article helpful? If you would like to go deeper into this subject of drawing your own leather tooling patterns, then get a full copy of our eBook “Introduction to Leather Floral Design.” Receive a free 5 Day Mini Email Course with your purchase of this digital book. Each day for 5 days, you will receive an email with an exercise that will help you to dive a little deeper into the topics discussed in the book.